Returning with sharper styling and a larger boot, the new Focus is back with a bang. It's still the most fun car to drive in the segment too. The Ford Focus. It’s been a vital money maker for the company for 20 years now, and for good reason. Fun to drive, sharp looks and attractive pricing have always ensured it’s remained among the UK’s most popular cars. And now there’s a new one. 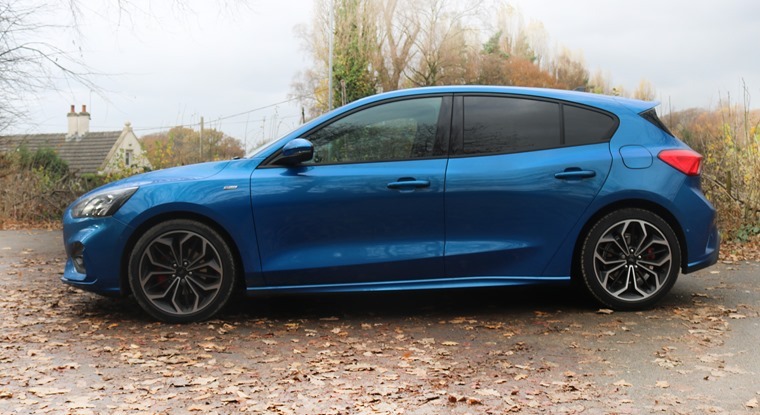 Thing is, thanks to attractive finance packages, it’s not only up against its traditional rivals such as the Volkswagen Golf and Vauxhall Astra these days, but a host of other hatchbacks ranging from the up-and-coming Kia Ceed to the premium BMW 1 Series. And we’ve not even mentioned the burgeoning crossover market. In short, it has to deliver. The Focus has to be all things to all people. So is it? Whichever trim you choose, you’ll not be disappointed with the way the Focus looks. Well Ford’s pulled it out the bag in the looks department, for starters. The styling is sharp and fresh and a pleasant break away from its predecessor. The model you see in the pictures is the ST-Line model. That means 17in alloy wheels and a twin exhaust, and we reckon it looks rather fetching in Desert Island Blue. 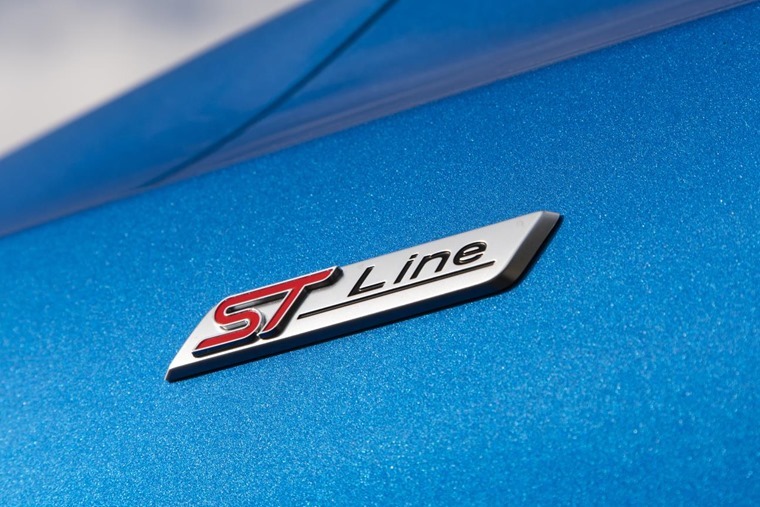 ST-Line trim is based on the Zetec model, and aims to sway consumers away from the Golf’s R-Line and the Seat Leon FR. Whichever trim you choose, however, you’ll not be disappointed. Its closest rival – and often considered the benchmark of the hatchback world – is of course the Golf. 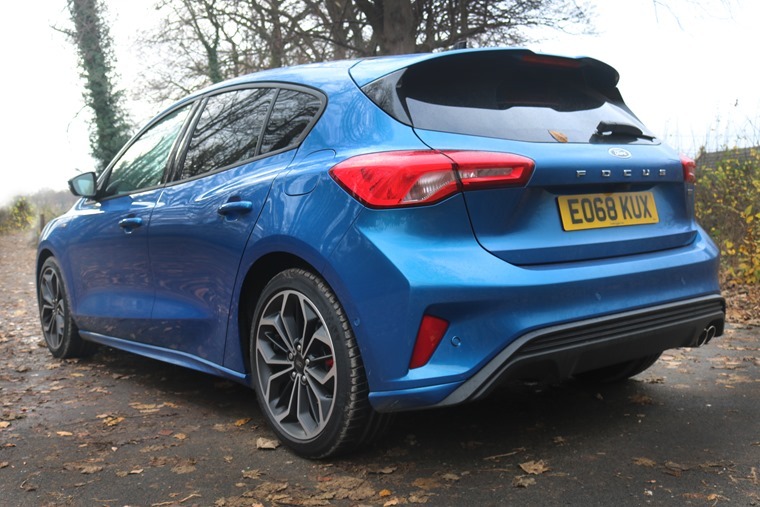 The seventh generation is now in its twilight years, and until the new one comes along, the Focus has it beat from an aesthetic aesthetic viewpoint. But how does it stack up in other areas? 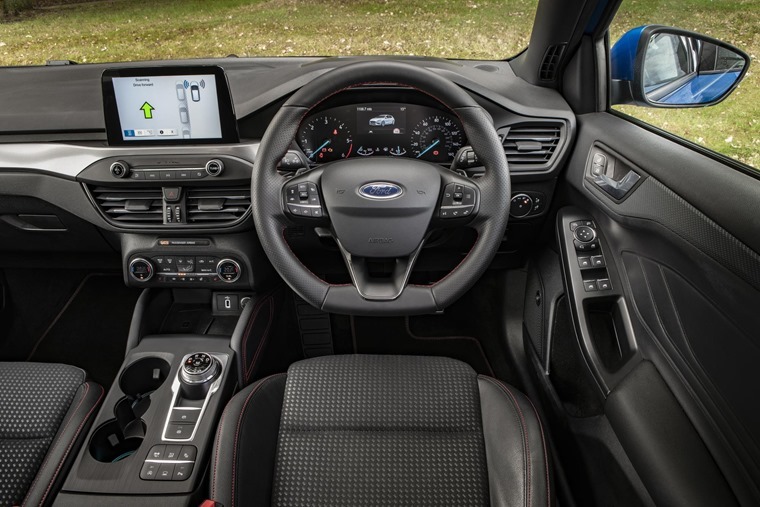 In the cabin, it’s obvious Ford has taken some inspiration from its VW-badged rival. Where once there was a handbrake, you’ll now find an E-brake button. This allows for some additional stowage space between the front two seats… just like a Golf. The titanium-effect trim adorns the dashboard and doors… just like a Golf. What isn’t quite like a Golf though, is the quality of materials. Despite boasting a host of driver-assist tech and a much-improved infotainment system, a prod of the lower dashboard area reveals that material quality isn’t as good as it could be, with lots still being rather hard black plastic. Although it’s not quite up there with the Golf, it still manages to feel more upmarket than the Vauxhall Astra or Seat Leon, but is nowhere near the standard of the BMW 1 Series or Mercedes-Benz A-Class. Gone is the button-laden dash of the old car, now replaced with a much cleaner looking design like that of the new Fiesta. The centre-piece on our ST-Line test car is a vivid 8in touchscreen infotainment system with Ford’s latest SYNC3 software. Admittedly Zetec models and below only get a 6.5in screen, meaning the Golf’s standard 8in system has it beaten here. It’s a similar story with other tech – you’ll have to opt for ST-Line X or a Titanium model to get things like parking sensors, heated seats and sat nav as standard – things that all feature on a mid-range Golf SE. The major drawback of the old Focus was its puny 316-litre boot. Thankfully this has been addressed with the new car, which gets 375 litres of space. This puts it slap bang in the middle of the Astra (370 litres) and the Golf (380 litres) – a marked improvement. The Focus' dynamic edge is back with the new model. The Golf might have always had the edge when it comes to quality, but the Ford has always made up for this behind the wheel behind the wheel. When the original Focus launched in 1998, it moved the dynamic expectations of a none-performance, none-assuming family hatch into a different league. Even Ford themselves failed to match the original in recent years. But with the new one, that dynamic edge is back. From the driver’s seat, it’s probably the new benchmark of what a hatchback should feel like. Steering is well weighted and balanced through the corners and it feels stable and well-grounded, no matter the type of road you’re tackling. Body control on sporty ST-Line trim is improved further by a 15mm reduction in ride height, but this doesn’t affect the ride. Its excellent refinement is worth highlighting too, with minimal wind and road noise on the motorway. The Focus is more than capable of matching – or exceeding – most rivals when it comes to refinement, practicality and driver engagement. There’s a wide engine range to choose from, with petrol power coming from either a 1.0-litre turbocharged EcoBoost unit or a larger 1.5-litre unit. The former is available with 84, 99 or 123bhp and the latter in 148bhp or 180bhp form. The one we’d recommend would be the 123bhp 1.0-litre unit, which feels similar in terms of power to the 148bhp 1.5-litre, but will prove cheaper to run. A 1.5-litre EcoBlue diesel comes in two states of tune, producing either 94bhp or 118bhp. A more potent 150bhp 2.0-litre unit is also available. While both units are a little louder than the petrol at idle, once underway there’s not much in it in terms of noise intrusion. All engines are frugal enough, with the diesels capable of more than 50mpg on a combined cycle. A slick six-speed gearbox is standard across the range, but our ST-Line 1.5 120 test car featured the optional eight-speed gearbox – also available on the most potent 1.0-litre and 1.5-litre petrols. This is now controlled via a rotary dial by the driver’s knee rather than the traditional stick. It feels a little out of the ordinary at first, but you soon get used to it and it also results in a much more usable space on the centre console – where you’ll now find two cup holders. It’s safe to assume it’ll prove to be one of the UK’s most popular cars over the coming years. Price-wise, the Focus is around the same price to lease than the Golf, and indeed its plethora of direct rivals. Expect monthly payments to cost between £175 to £250. But should you plump for one over the go-to Volkswagen? If you want a drive that’s as good as the car’s looks suggest, then yes you should. 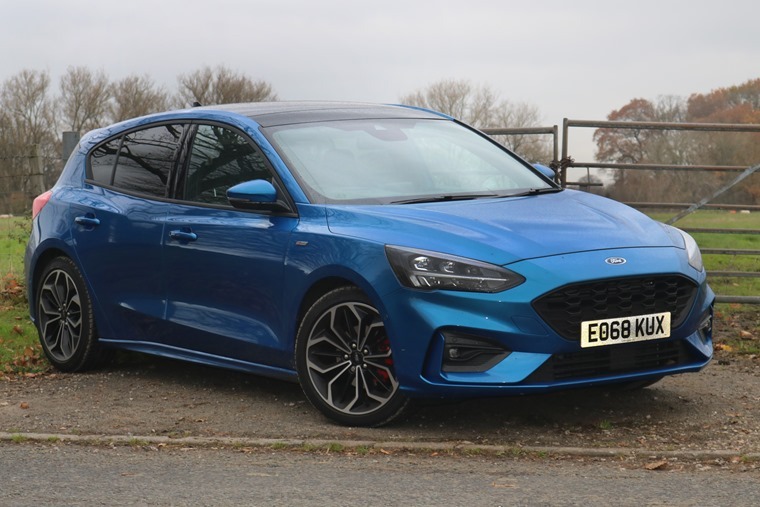 The VW might still nudge it for interior quality and equipment, but the Ford is more than capable of matching – or exceeding it – when it comes to refinement, practicality and driver engagement. 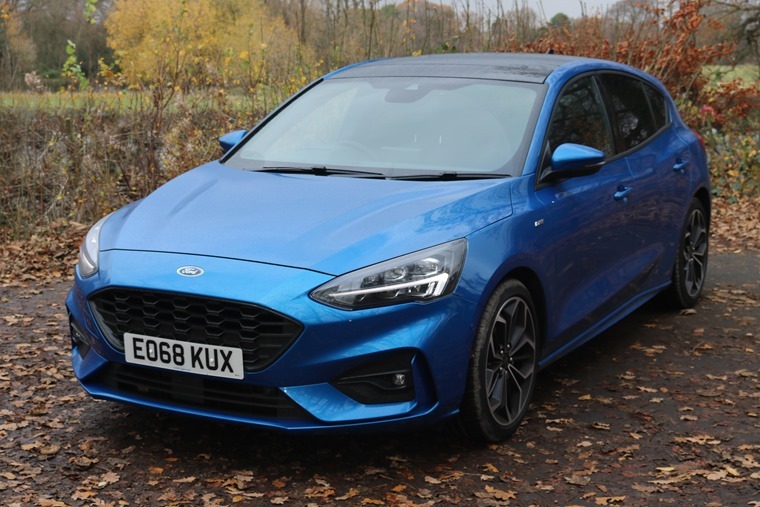 Whatever is written or said about the new Focus, however, it’s safe to assume it’ll prove to be one of the UK’s most popular cars over the coming years for a variety of people. It’s a good job, then, that it is a very, very good car indeed. One of the sharpest-looking hatches about, the new Focus looks the part. Much improved in the tech and infotainment stakes, but still not quite a match for the Golf’s overall quality. Better than ever thanks to engaging steering, great ride and a strong range of engines. Upcoming ST and RS versions should offer a credible rival for the Golf GTI and R.
More space in the rear and airier thanks to some additional glass. Boot an improvement and now on par with key rivals. All engines capable of more than 40mpg, with diesels theoretically capable of 50+. Our 1.5-litre 120 diesel averaged 51.6mpg in mixed use.